Pare fruit/bitter melon or which has the Latin name Momordica Charantia live in the tropics. Green or yellowish color when the fruit is old. Its roots and stems creeping shaped fibers. Pare commonly used for vegetables or treatment. In East Asia such as Japan and Korea, the fruit is more familiar to the ingredients. Being in some other countries such as India and Indonesia, bitter melon is consumed in the form of ordinary cooking. Existing distinctive flavor to the fruit is bitter melon. However, some people actually liked the taste is bitter because in addition also has a savory flavor. Behind the bitter taste of bitter melon fruit is hidden because it contains albuminoid various properties, carbohydrates and pigments. What are the benefits? Pare are hypoglycemic lowering blood sugar levels. This property is suitable for the treatment of diabetes to lower blood sugar levels in excess. Pare it does not contain harmful compounds when taken long term so that it can compensate for chemical drugs which will cause side effects if taken continuously. Because the calories are low, then the fruit can be used as one of the menu for those who are on a diet obesity. The bitter taste of bitter melon can be reduced when crushed using a salt that can be combined together with other food ingredients. You often shortness of breath? There is good news from a green fruit that smells bad. It turns out that the bitter taste of bitter melon actually generate cells of taste buds in the respiratory tract to move wider. That is, the respiratory tract becomes looser and air circulation happen smoothly. Research conducted by the University of Colorado Cancer Center concluded that bitter melon can be used to inhibit the growth of pancreatic cancer. The content contained in pare affect glucose metabolism that is needed by cancer cells. 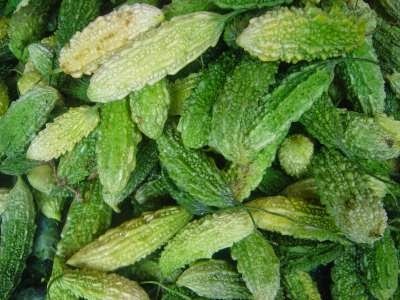 Pancreatic cancer is preceded by a lot of diabetes and bitter melon juice has been proven to be good for people with type 2 diabetes. Experiments conducted on mice with pancreatic cancer showed that bitter melon juice can reduce cancer cell growth by 60%. Excessive sun will burn your skin. As a result, the face will be wrinkled, dull and damaged. Now, to prevent damage to the face should be treated special, one using a mask pare regularly. Pare mask will help restore the health of damaged face due to exposure to ultraviolet light. HIV is incurable until now. However, that does not mean the virus could not be suppressed. The seeds of bitter melon fruit was effective suppresses the development of the HIV virus. At least, patients can prolong life by the fruit seeds. Good news about the bitter melon fruit seeds came from New York University and became important to the field of medicine.